Hello, guys! It might a bit late to share, but it's better later than never. 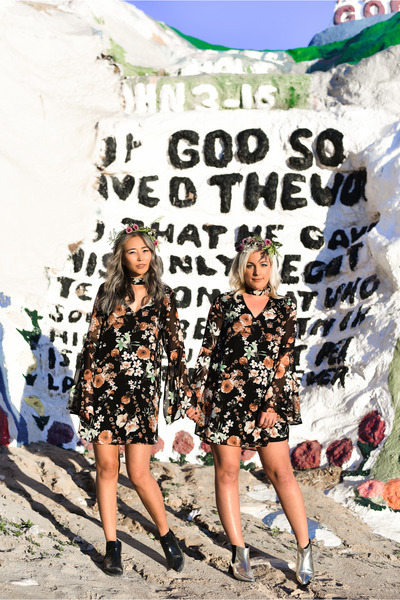 This year, instead of celebrating Valentine's day, my BFF Elyse (blogger of Faith In Style) and I decided to take a trip to Salvation Mountain and shoot our outfits to celebrate Galentine's day there. We wore some wonderful outfits that were provided by Lulus, and were lucky that the beautiful Claire Arceri did our make-up. After getting ready, we climbed the mountain and Andrew (her husband) took action to shoot two lovely gals in matching outfits. Since I have no patience, I decided to edit the photos myself and share with my readers our final team work. Salvation Mountain is an art project that is located in the Colorado Desert. If you ever plan to visit southern California, you should definitely check it out. Also, you can donate paints to the organization so they can continue working on this spectacular project that was started by Leonardo Knight, who died in 2014. I definitely advise you to visit this unique place. It's worth driving there and seeing a sunset on the top of mountain.